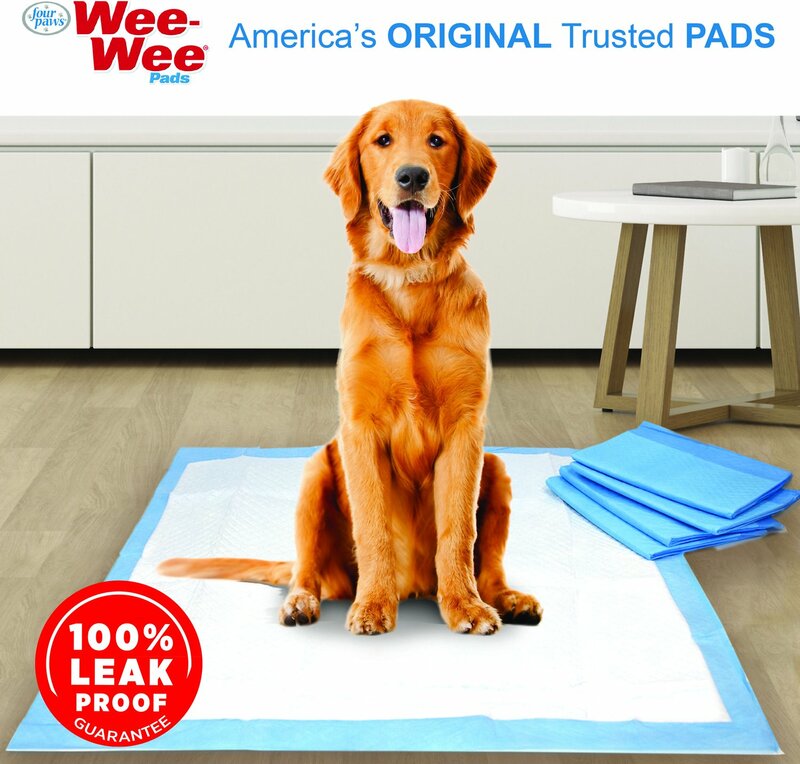 Wee-Wee Extra Large Puppy Housebreaking Pads, 28" x 34"
Help get your newest member of the family get used to his new surroundings with Wee-Wee Extra Large Puppy Housebreaking Pads. These training pads offer maximum absorption and are 100% leak-proof. They have 5 layers for extreme protection—including 2 reinforcing layers that pull liquid under the surface—while a super-absorbent polymer core locks in liquid. An added leak-proof liner guarantees your floors stay clean and dry, making these pads from Four Paws a great alternative when you can’t be home. Pads have 5 layers for extreme absorption and protection. Tear-resistant, quick-drying top layer of pads won't shred or cling to paws. Super-absorbent polymer core locks in liquid. Leak-proof liner keeps your floors clean and dry. Extra large 28 x 34-inch size is great for larger dogs or puppies that need extra surface area. Unfold pad and place on floor with plastic side down. Make sure pad is easily accessible to your dog, and located away from his bedding and food. Place your dog on the pad so he can become accustomed to it. When your dog "goes" on the pad, be sure to reward him for correct behavior. If your dog has any accidents away from the pad, return him to the pad to discourage this behavior. If using the pad for housetraining, gradually move the pad toward your door once your pet has learned to use the pad consistently. Eventually, you can move the pad outdoors to the area where you would like your dog to go potty. Wee-Wee is the ultimate go-to for pet parents dealing with those unavoidable accidents. From pet mess sanitizers and deodorizers, to potty pads and diapers, Wee-Wee makes cleanup easier and nearly hassle-free. Specifically designed for indoor needs, these products keep your home and pets safe without compromising quality or effectiveness. Wee-Wee knows pet messes, so they also know how to clean them up! The extensive line of cleaning products is effective without leaving a residue, while the pads and diapers are absorbent and designed for comfort and convenience. 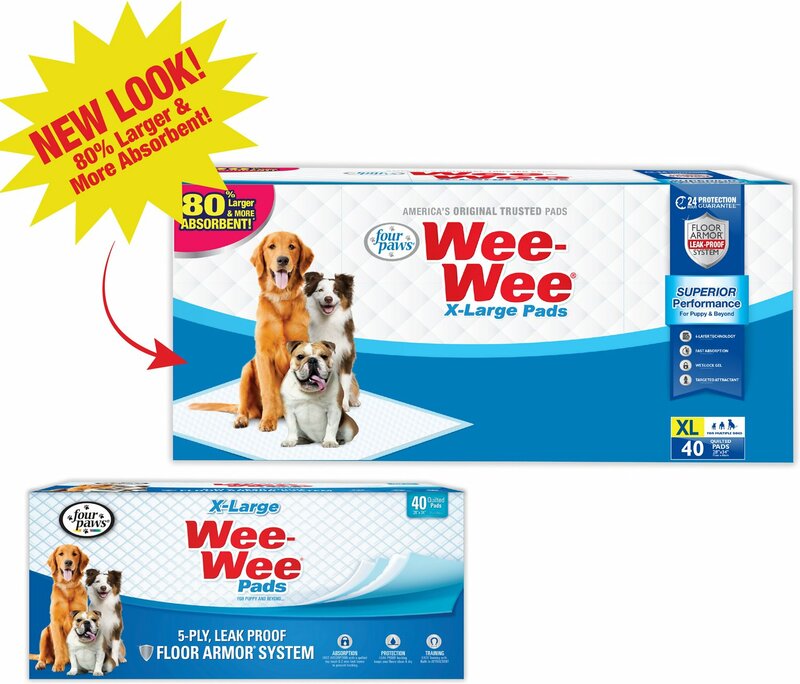 Designed for ultimate odor control, Wee-Wee pads provide a 5-ply leakproof Floor Armor System to protect your floors and carpets when nature calls. Perfect for early-stage puppy potty training or protecting your home from the occasional accident, Wee-Wee pads are treated to attract dogs when they need to relieve themselves. 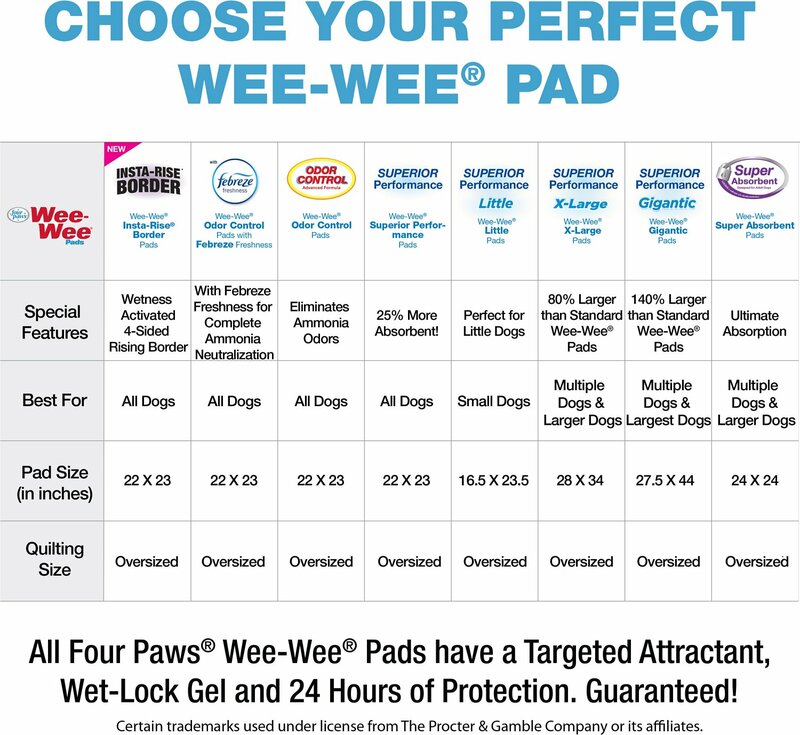 With multiple options, Wee-Wee is sure to offer the perfect pads for your pet and your home. Multiple sizes: From small breed puppies to large breed seniors, Wee-Wee offers a pad that is just right for your dog's size and age. VALUE PACKS: From 6-count to 200-count, you can find Wee-Wee pads in the right quantity for your household. With scented or unscented options and even an eco-friendly pack made with a heavy-duty liner from 50% recycled materials, Wee-Wee is sure to have the right fit for your preferences. Wee-Wee also offers diapers and male wraps that are the perfect indoor solution for incontinence, pets in heat or excitable urination. Available in multiple adjustable sizes with a stretch waistband and tail opening, these highly absorbent diapers are a comfortable option for your dog and will give you peace of mind. With reusable, machine-washable options or disposable liners and diapers, Wee-Wee is sure to have the perfect choice for your pup's needs. Specifically designed to work on a multitude of surfaces, from carpets or hardwood to pet beds, Wee-Wee offers a variety of cleaners, stain removers and deodorizers to clean up even the most worrisome pet messes. No matter the pet mess, Wee-Wee is sure to have a product to help resolve it and clear the air. Safe for pets and homes, leave the worry to Wee-Wee! Wee-Wee is committed to making sure that their products are usable for both owners and pets. Made by Four Paws, an innovative company committed to quality and customer satisfaction since 1970, each product is tested before making its way into your home. Find indoor solutions that pet parents love with Wee-Wee. Best Wee Wee Absorbent Pads! 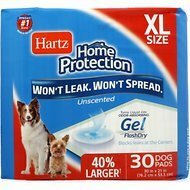 These are the best absorbent pads for our dogs. My parents are seniors and do not like to walk the dogs late night so they use these pads for our two shih-tzu babies. Chewy delivers them monthly and at best price always on time! Love these pads and the great price that goes with them through Chewy. Use these pads as liners for the bottom pans for my exotic bird cages rather than using newspapers, etc. They work great--a lot cleaner and easier to use. I needed to get some pads without any scents and I was so HAPPY I selected these because my pups took to them like fish to water! I am coming back constantly to buy more because with a Chihuahua's household we need these. Enjoy the large size less mess on the floor no scrubbing and cleaning up after. My sister's getting some now too for her dog's. Best pads I have ever found in 20 years !! I have been buying wee-wee pads for 20 years now and these pads are the best I have found. Chewy.coms delevery service is wonderful !! I use this large size because I have 4 little Japanese Chin dogs. It works great for me. Why would they put a flimsy plastic edging on these pads? why? Puppy goes crazy for it, chewing and ripping it and yanking the pad all over the place. Actually, I use these pads under my cat's litter box since my male cat sometimes goes over the edge of the box. These are the perfect size under my large litter box, and makes clean up easy when necessary. I will purchase them again. This product works great. It is well priced & is a definite when u have a new puppy thank u chewy ur #1 to us all paws up!!! After trying another brand that leaked, Chewy’s always outstanding customer service gave me credit and suggested these Wee Wee pads. 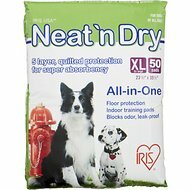 For my elderly dog who chooses the floor over going out the doggie door in the snow, they are a life (and floor) saver. I’ll choose these again. My dog is 18 pounds but I have trained her to puppy pads. I could use some a teeny bit bigger so I tried these out. I could still go for another couple inches but these are excellent soaker uppers and will do great. I wish I could give these a 0 but I cant! I have 2 small 10lb dogs and I let them use the pad one time and every time it leaks right through. The WORST THINGS IVE EVER BROUGHT!